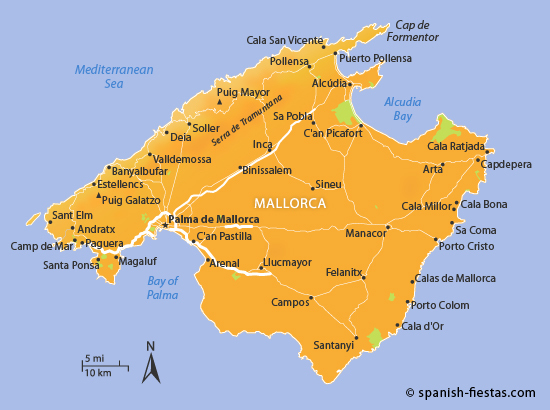 Mallorca (or Majorca) is a Mediterranean island of stunning natural beauty. Its early reputation for cheap mass tourism emerged from the large scale developments on the island’s south west coast. Early resorts which remain popular today include Magaluf and Palma Nova to the west of Palma and Can Pastilla to the east. In more recent times Mallorca has reinvented itself with an emphasis on more upmarket tourism with visitors encouraged to explore the island’s beautiful coastline and interior. The east coast of Mallorca consists of more than fifty secluded coves of enormous beauty. Cala Millor or Cala Bona are ideal bases from which to discover this region. Flights: Mallorca’s Son Sant Joan Airport lies just 8km east of the city of Palma de Mallorca on the south-west coast of the island. It is one of Europe’s busiest airports with more than 20 million annual passengers going through its terminals. Whilst Air Berlin, easyJet, Ryanair and Vueling are amongst the biggest operators serving the airport there are international flights from all over the continent as well as services to and from numerous Spanish cities. There’s a great choice of transport services from Mallorca Airport to Palma and destinations all over the island including a number of specialist shuttle operators. Ferries: If you’re already in Spain you can get to Mallorca from the mainland using one of the two main ferry companies serving the Balearics. Transmediterranea Ferries operate ultra-modern ferries which connect Palma with Barcelona, Valencia, Ibiza and Mahon. The journey from Barcelona takes about seven hours but there is also a high speed catamaran which only takes 3 hours 45 minutes. Another company called Balearia Ferries offers the same routes as Transmediterranea plus a connection between Palma and Denia which is south of Valencia. Approximate journey times to Palma are 7 hours from Valencia and 5 hours from Denia (this service goes via Ibiza). The weather in Mallorca is pretty much what you would expect from one of the Mediterranean’s premier beach holiday destinations. Every summer millions of tourists from all over Europe fly into Palma’s Son Sant Joan Airport in anticipation of long, hot days and lovely, warm nights. They won’t be disappointed. The peak summer months see temperatures rising above the 30ºC in the afternoons with rainfall highly unlikely other than the odd summer storm which is usually most welcome after enduring such heat. From the rainfall and temperature figures presented below you’ll see that July and August are both the driest and the hottest months. They are also the most expensive for holidays and the busiest time for all the resorts. If you are flexible on travel dates and don’t need to be on holiday during these peak months then I’d strongly recommend that you consider visiting Mallorca on either side of them. Personally I love being on the island at anytime in May or June as well as during the month of September. It’s still busy with plenty going on all over the island but without the scorching summer temperatures and the masses of people tied to school holidays from all over the continent. Daytime remains really nice and warm with pleasant evenings for dining outdoors. It’s more difficult to suggest when you visit Mallorca in winter as the weather is far less predictable. As a rule winters are quite mild and mainly dry with many sunny days with beautiful clear skies. Whilst daytime temperatures seldom fall below 10ºC or 15ºC you can certainly feel a certain chill in the air. It may not be hot enough to go to the beach but sunbathing in a sheltered spot should be fine. It can become quite chilly in the evenings so you’ll need to pack accordingly. January and February tend to be the coldest months. There is rainfall during the winter months but it rarely lasts more than a few days (hopefully not the few days when you’re there!). October to December tend to be the wettest months. If you’re heading out to Mallorca in the next few days you can check the short term forecast below. If not take a look at those weather graphs I mentioned above to get some idea what you can expect with regard to rainfall and temperatures based on previous years statistics. Hotels: Thanks to the perennial popularity of Mallorca there are hotels all over the island to suit all tastes and budgets. In fact there are more than 50,000 properties listed on the Booking.com website ranging from luxury 5-star properties to simple, budget options. In addition there are traditional farmhouses which have been converted into rural retreats as well as a great selection of villas and apartments available all over the island. Holiday Rentals: Renting a holiday villa or apartment in Mallorca provides a fine option for family holidays. Although villas are available for rent in stunning locations all over the island it would be fair to say that some of the most exclusive properties can be found in the region around Puerto Pollensa and Alcudia on the north coast. Prices for Mallorca villas with pools obviously peak during the summer period and finding good deals is very difficuly, however, if you’re not tied to these months you might find some good offers. Self-catering holiday apartments are widely available all over the island. Package Holidays: All of Europe’s big tour operators feature year round holidays to Mallorca. For an idea of what’s on offer take a look at package deals with easyJet Holidays. 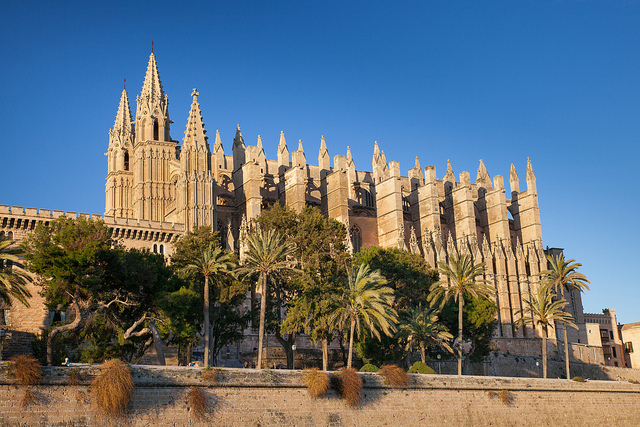 Palma de Mallorca: In their haste to get to their holiday accommodation and to stay there so many visitors never find time to visit the capital of Mallorca which is one of Spain’s most beautiful cities. Some of the highlights of the city include the La Seu Cathedral which took almost 400 years to build, the Royal Palace of La Almudaina and the circular Bellver Castle which overlooks the Bay of Palma. Time permitting it’s well worth taking a full-day vintage train journey from Palma to Soller. 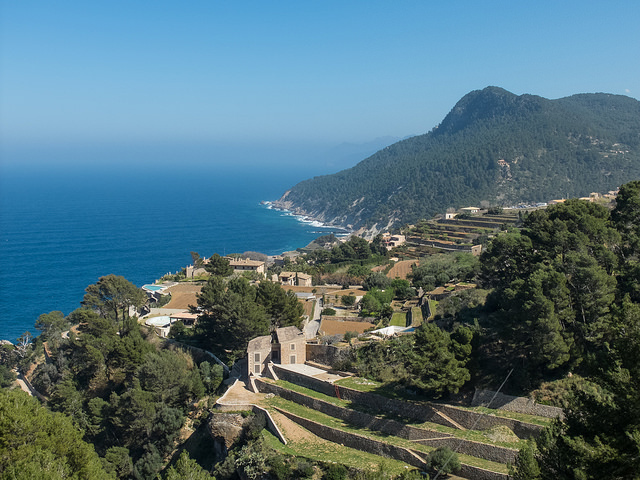 Serra de Tramuntana: This the mountain range runs parallel with Mallorca’s north-west coast. Its landscape has been recognised by UNESCO which named it a World Heritage Site. The rugged terrain and mountain peaks present quite a contrast with the gentle east coast. It’s well worth renting a car driving the stunning north-west coast from Alcudia in the north to Andratx in the south. Highlights of the journey include the Monastery at Lluc, Soller, Deia and Valldemossa. Theme Parks: With a selection of waterparks and theme parks in Mallorca there’s plenty to keep the kids entertained when they’re looking for a change from the beach or hotel pool. Caves of Drac: Located near Porto Cristo on the east coast, the Caves of Drach are one of the island’s top tourist attractions. There’s a large lake inside the caves where a short classical music performance takes place during visits. Cap de Formentor: If you’re staying in the north of the island you really must take the short drive to Cap de Formentor for spectacular views at the northern tip of the island. In fact, if you’re looking to do more than sitting on a beach for the duration of your holiday then it’s well worth hiring a car and taking some road trips into the interior of the island or driving the epic west coast. Mallorca Beaches: Few major tourist destinations are blessed with the range of fabulous sandy beaches which Mallorca has to offer. As well as some outstanding ones located right at the main resorts there are many secluded ones scattered all around the coast. Country Markets: There are some great markets around Mallorca which are more than just tourist traps. You’ll find the majority of people there are locals buying fresh produce whilst typical Mallorquin products are available to visitors including ceramic and leather items. Golf Courses: With around 20 courses scattered around the island Mallorca is a perfect golfing destination blessed with stunning scenery and an idyllic climate for many months of the year. Yacht Charter: If you’re looking for something very different why not look into chartering a yacht in Mallorca and sailing around the Balearic Islands. South-West Coast: Mallorca’s south west coast is the top destination for package tourism. There are plenty attractions for all age groups including families but this is certainly the place to go for 18-30s looking for a good time. Top resorts are Magaluf and Palma Nova. North-East Coast: There are great beaches along this coast and controlled tourism development has led to some very attractive resorts such as Puerto Pollensa and Alcudia. Many activities are available and the are is popular with walkers, birdwatchers and cyclists. This is an ideal choice for families and visitors looking for a quieter time. 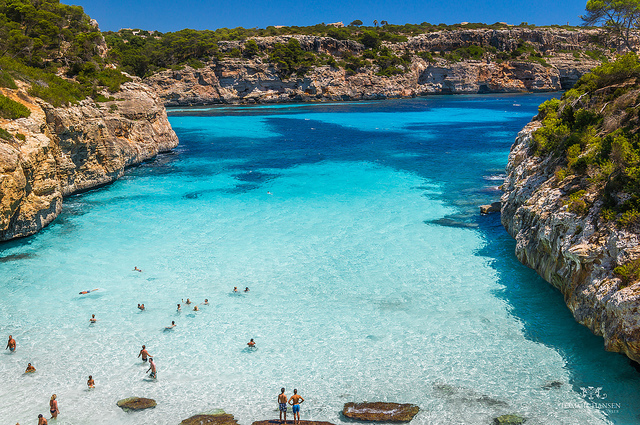 East Coast: Mallorca’s east coast is populated with dozens of small coves and beautiful bays. Tourism is well developed here and is geared towards family holidays in resorts such as Cala Millor and Cala Ratjada. North-West Coast: There aren’t really any resorts as such along the rugged northwest coast. This is an area of beautiful mountains and rocky cliffs dropping down to the wild sea below. The area is popular with day trippers and there’s plenty accommodation available if you prefer to be away from the traditional resorts. With a great beach and enough entertainment for everyone Magaluf is the island’s most popular resort for package tourism. Although its nightlife is a little on the wild side during the peak summer months it remains a popular choice for family holidays. Just down the road from Magalluf and within walking distance is the ever popular resort of Palma Nova which is lower key on the nightlife yet still a popular choice for all age groups. Santa Ponsa is a popular resort for family holidays which overlooks a lovely bay. It is only 8km from the many tourist attractions of Magaluf. Located near the island’s most northerly point at Cap de Formentor this resort has long been established as a favourite with holidaymakers. This whole area is very popular with cyclists, walkers and birdwatchers. It offers a fine of hotel and apartment accommodation. 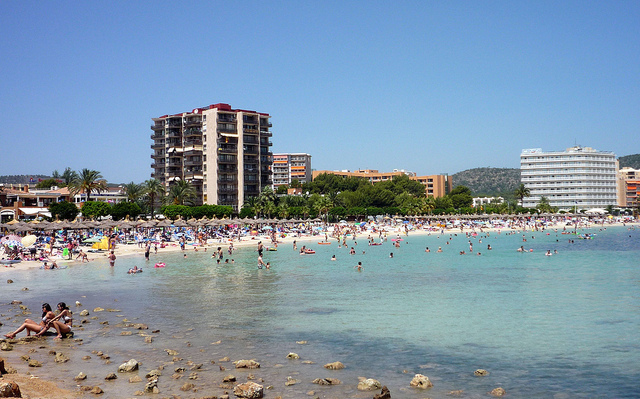 Alcudia on Mallorca’s beautiful northwest coast is a fine destination for holidays all year round. Development has been sensibly controlled leading to generally low rise hotel developments over a large area. Cala Millor is the premier resort of Mallorca’s east coast thanks to its magnificent beach and tourism infrastructure. A well maintained resort with a fine selection of accommodation. Cala Bona is a quaint little resort neighbouring Cala Millor on Mallorca’s east coast. There are many British visitors who are keen to avoid the mass tourism resorts. This resort area has a 6km beach near the airport which stretches all the way from Can Pastilla to Arenal. C’an Pastilla is a popular resort lying right on the coast next to Palma de Mallorca’s international airport. Its accommodation infrastructure is well established with newer ones slightly east on the main Playa de Palma. Cala Dor is a pretty little resort on Mallorca’s east coast with nice beaches and a stylish marina. There are a few nice hotels around and a good selection of private apartments. Cala Ratjada is a pleasant resort with many beautiful beaches nearby. Older properties line the seafront whilst better quality options are set back a few streets on the way up to the Alcudia road. C’an Picafort is a low rise resort on the north coast with a good selection of self-catering accommodation. It has a busy port from where a number of boat trips depart.